Comments/Context: Color, and its relationship to technology, is an intellectual area of study that has more arcane complexity to it than most of us could ever possibly imagine. Without getting lost in the details, it all starts with high school anatomy – our eyes and the optical processing system (including the iris, pupil, lens, retina, rods and cones etc.) that convert visual stimuli into electrical impulses that are ultimately sent to the brain. Using this architecture as a general model, ingenious humans have subsequently gone on to build a variety of technologies that mimic or replicate this “seeing” process, the camera being among the most notable. Depending on the cameras and photographic processes in use, incoming light is filtered, separated, and converted in multiple steps, with “color” being meticulously reassembled later and eventually output on chemically treated paper or now more often on pixelated screens. Along the way, there are countless details and nuances that can affect the end results – “color” is less of a definitive reality than a friendly catchall term for something decidedly tuned and manufactured, with a structured set of conversion and calibration steps that bring it from beginning to end. All of this is offered as a background preamble to thinking about the work of Canadian photographer Jessica Eaton. Eaton has built her impressive career in contemporary photography by experimenting with the technical aspects of color processing in ways that few of us can even understand or hope to follow. An innovator in the mold of Berenice Abbott (particularly her later life scientific images from MIT), Eaton has restlessly dissected the ins and outs of analog color in the past decade, using her learnings to enable original photographic outcomes. By patiently unpacking the technical details of color, she has opened up new doors for her own artistic improvisation. Two works from Eaton’s new Transition series build on her previous investigations of the additive properties of light/color. In her Cubes for Albers and LeWitt series, she used simple painted cubes in various shades of grey and repeated exposures using RGB color separation filters to iteratively test how photographic color is constructed, all of her outcomes built in camera. One of the critical learnings from those images was that unlike paint which eventually becomes black with successive additions, light ultimately becomes white, and so more and more layers meant brighter and more vibrant color combinations, even though her subjects were initially grey. This same idea is pursued a few more steps in Transition, only this time Eaton is using grey scale striped discs as her raw material. Her results look like elaborate Venn diagrams, with overlapping circles intersecting and interacting, her use of multiple exposures revealed through shadows that hover and dissolve underneath certain discs. 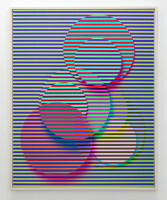 While the initial circles were striped in various shades of grey, the outcomes multiply those bands and striations out into tight combinations (often duos and trios of repeated color groups), creating compositions that shimmer with the illusory uncertainty of Op Art. Eaton has also experimented with scale here, making her largest image ever, a huge wall-filling tumble of interlocked color. The Transition works echo their simple title – they are taking ideas from earlier projects and leveraging them in new but adjacent directions. Eaton’s Pictures for Women series breaks this pattern of step-wise incrementalism, and instead offers the closest thing to straight photographs we’ve ever seen from the artist. The works are all dominated by a central circular form that seems to recede away from perfect crispness into indistinct concentric rings of color edged by a soft blur. The images are created by taking reproductions of paintings (all made by female artists inspiring to Eaton, all of them abstract painters, at least in the works on view), placing them on a hybrid turntable/easel, and making long exposure photographs of the rotating pictures. So the gently seductive blur we see is actually motion, and the resulting colors are derived from spinning (and thereby mixing) the ones in the original artworks. Paying homage to the female artists that have gone before and provided Eaton with role models or points of reference says that Eaton is well aware of the path she is taking in making her work. That she has done so with abstractions of abstractions indicates that she has taken their collective lessons to heart – she has stepped on their shoulders, but also brought her own inventiveness to the conceptual interchange. Even if we consider the anatomical echo of the feminine circular openings an analytical conclusion too far, it’s clear that Eaton wants to place her work in a certain historical context of women, and actively engaging with Sonia Delauny, Hilma af Klint, Carmen Herrera, and Tomma Abts encourages us to make thoughtful artistic connections far beyond the reaches of process-centric contemporary photography. I only wish there had been more of these spun works to see (and perhaps a handy cheat sheet of the corresponding original paintings), as a grid of a dozen or more might have meaningfully expanded our understanding of how Eaton is drawing from her larger network of influences. In the end, this show felt a little like a tantalizing appetizer plate. With so few works on view (only 6, sparsely hung), we can only guess at the depth of these two new lines of thinking. It’s time for Eaton to start embracing the medium of the photobook, so we can all have the opportunity to see more examples and to delve deeper into her meticulously considered iterations, variations, and machinations.